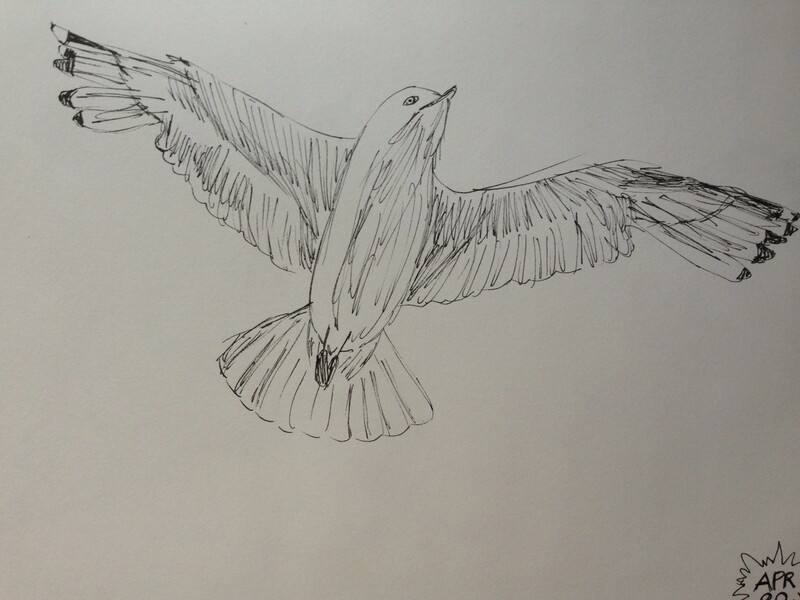 I saw a gorgeous photo of a seagull in flight from Crooked Tracks at this link and just had to try to capture it on paper. This one ^^ was done in watercolor pencil and I chose a paper that’s too small, leading me to have to cut off part of one wing. What an insult! Sorry, my seagull friend. I tried a bunch of different mediums. 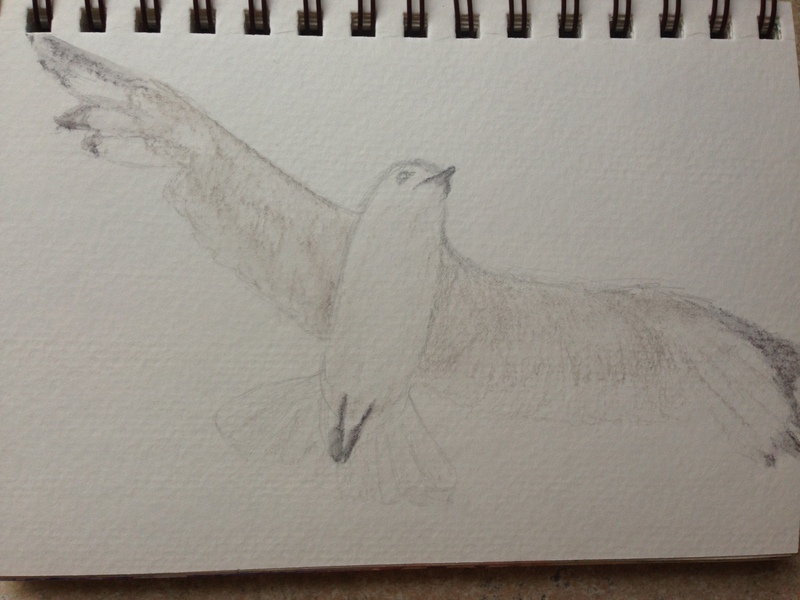 This one ^^ was Polychromos colored pencil, and I bet I’ll be drawing/painting this again and again in the next weeks and months, because this, to me, is exactly what I think of when I think of a soaring bird. For sketches, I guess I’m happy with these, but this guy deserves some time and effort, don’t you think? To all my birdie artist friends: Don’t you just wanna drop everything and draw or paint this?! Once you visit the photo, I bet you will. This ^^ sketch attempt, using a Faber-Castell Pitt artist pen, fine nib, gave me a whole new appreciation for you pen and ink artists. Using this medium after drawing mainly with colored pencil for the past several months made me want to crumple this up and toss it in the trash. What an unforgiving medium ink is! Do I like the look of a finished ink sketch? (Well, assuming it’s not done by me…) Yes, of course! It’s lovely. But for the artist…wow. I found this extremely challenging, almost to the point I’d call it un-fun. Maybe it’s the choice of subject here? An almost white subject probably wasn’t the best choice for my first try. Also, the fine nib is not what I’d call fine, having used (and dried up) a Micron .005 pen for several months to outline other paintings/drawings. So, every mark made with any pressure at all is like SCREAMING IN CAPITAL LETTERS and if you go awry, it seems really obvious. Not sure I’ll be trying a pure ink sketch again anytime soon. I’ve tried to get a photo of a seagull in flight, but haven’t found it easy! The best one I was able to get in real life is my avatar photo. The photo from Crooked Tracks, though, is just what I was looking for (and stalked hundreds of seagulls to get last October, to our mutual chagrin). I want to send out a big thank you to Crooked Tracks for posting this amazing photo! I wish I could say I’ve done it justice, which is why I will be trying it again and again. To be honest, these are all sketches. I haven’t yet devoted the time to this photo that it deserves. But it will happen! Maybe soon. We shall see. I hope my friends in the Northern Hemisphere are enjoying the spring, and I hope you get a chance to take in some of Mother Nature’s artwork today. God is the best artist ever, and the hardest to imitate! Peace, all. I love the ink drawing; you are way too hard on yourself. The pencil drawings have a softer effect; the ink makes it more dramatic. Thank you for your kind comment. I appreciate it more than you know. Good Thursday-almost-Friday morning to you! Those are beautiful sketches! I have taken art lessons from lots of different people, including my parents and friends, but never really got the hang of ever drawing anything but stick figures. (Which I rock at) I also have been birdwatching since I was 3, so I am absolutely impressed that you were able to capture this seagull so beautifully! The ink sketch is my favorite for its bold flair, but I have tried to sketch with ink before and YES! It is very tedious and almost unenjoyable to work with. But you did a wonderful job so congrats! Well, Ms. Laura – I have come to love everything you do and cannot wait to read your posts each morning. The first thing I thought of was “she’s SPREADING HER WINGS and she is SOARING freely and proudly.” They are all beautiful in their own way, and you so inspire me. Thanks for mentioning lifeinbetween.me :). What a compliment! You made my day. I’m going to try a quick drawing/painting this morning before getting to work. Because of you, my dear – I’m losing my fear! Happy Thursday and keep spreading those wings and soaring!!! I decided to do this for S because if our recent discussions!! Thank you so much for your kind encouragement, and I’m so glad you’re drawing/painting this morning!!!! Woooooot!! :))) Have a rocking Thursday, my sweet! Oh – just finished a little one and need to get to work now – am a bit frustrated. Want to be good at this – and it’s not happening. GRR! I need to just enjoy and not worry about being good! I struggle with this too. People spend a lifetime at this! You wouldn’t sit down at a piano and play Beethoven right away. I have to keep telling myself this. 10,000 bad pictures first!! Keep getting the miles on the brush/pencil. Fly, birdie! I hear you on the unforgiving nature of ink. And yet…those black lines! I like the drawing. I see no mistakes. Thank you. It helps the photo isn’t right there for comparison, believe me. Please do! I’d love to see it, if you felt like sharing! But it’s a gorgeous shot. I just love it. Thank you, Jill! 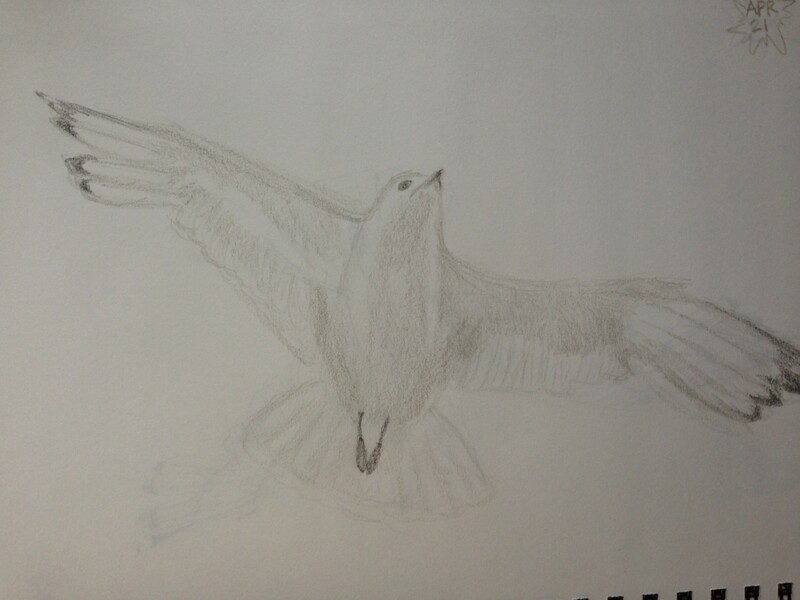 I don’t think you give yourself enough credit; you are a fine artist in your own right, and I love your bird art! I bet you could do this with no sweat! Soar, baby, soar! Wooot! TGTF. I hope you’ll have extra creating time this weekend. Are you feeling better? I hope. Thanks Laura! It would be great if each person could see all the hard work that goes into each post and art one creates! 😊 But then maybe we wouldn’t try it? I agree that creating AND posting every day helps me improve. Some days are easier than others! LOL! I think you’re right. It’s probably better if we don’t know everyone’s backstory. We’d be too afraid to try…and fail. I’m just amazed that people think they should be able to sit down and draw or paint, effortlessly. Can anyone do that, even the really gifted people? I wonder. I don’t know enough about art history to know how the greats began, even. I don’t think anyone is “that” talented that it’s always been effortless. We all have to work at it. I think what makes an artist is passion. The passion (and for some, the need) to create. Thus, more miles on the paintbrush! Thanks, Inari, I didn’t know about that site! I’ll check it out! Love this post and all of your sketches in their different ways!!! They´re all beautiful!!! Thank you! You make a great point. There are tons of different gulls. I have so much to learn there. They’re all equally beautiful in my eyes. I’ve been partial to them all my life. I’m so glad you enjoy them, as they wouldn’t exist without you! Thanks so much for your wonderful photographs!